By virtue of the stability of its amorphous silicate network, glass is a material with excellent chemical inertia with respect to almost all acid and neutral substances, and has good resistance even in the presence of weakly alkaline pH. These properties make it the best material for containing over a long period of time food, beverages, pharmaceutical preparations, and even chemicals and reagents, as it excels in resisting the aggression of its content and performs protective functions against alterations or external contamination of this latter. To quantify the ability of a certain glass composition to resist chemical aggression, SSV is equipped to perform various types of tests, both using standard methods and tailored tests according to customer specifications. The test is carried out suspending by means of an inert wire (e.g. Pt) a planar glass sample of standard size inside an alkaline aqueous solution, which is brought to boiling temperature inside a special sealed metal container. At the end of the test, the degree of alkaline corrosion of the glass is gravimetrically estimated, that is calcualted by measuring the weight loss suffered by the sample as a result of the test. The test is carried out suspending by means of an inert wire (e.g. Pt) a planar glass sample of standard size inside an aqueous solution of hydrochloric acid (HCl), which is brought to boiling temperature inside a special glass container under reflux conditions. At the end of the test, the degree of acid corrosion of the glass is gravimetrically estimated, that is calcualted by measuring the weight loss suffered by the sample as a result of the test. The test is carried out by subjecting glass granules of a well defined size range to the attack of milli-Q water at 98°C (ISO 719) or 121°C (ISO 720). The quantity of alkali ions released during the test by the glass is then determined by titrating the test solution with HCl: the higher the original release of alkalis, the worse the chemical resistance of the glass to hydrolytic aggression. Glass tableware must ensure an adequate level of durability against aggression by detergents used in dishwashers. 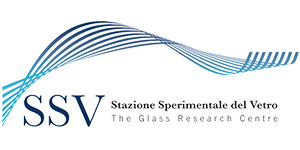 SSV is equipped with a special experimental dishwasher, capable of subjecting glasses, tumblers, plates, carafes or other glass objects to the standard washing cycles required by industry regulations (EN 12875-1).